For the last couple of years the ASUG Ontario chapter has been handing-out our ASUG CANADA #GlobalPuck give-aways at SAP conferences and events like SAPPHIRE and SAP TechEd. Our players and friends take their Global Puck hockey-pucks with them on their travels around-the-world and Tweet us photos from their Journeys. In 2018, we had 109 Tweets from Five-Continents and locations from Australia to Iceland to Zanzibar. Data contains 2+ years, 500+ tweets from Dozens of Players with Long/Lat Geodata to explore in ERSI & SAP Analytics tools. 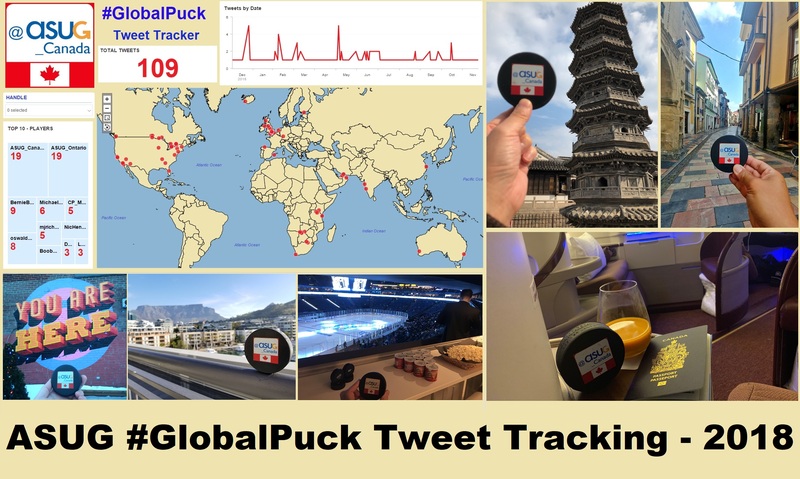 Have fun, and feel free to share with our #GlobalPuck Open-Data with anyone who is looking for a Multi-Year, Global Geo-Data sample to play around with for Training, etc. Feel free to post your Data-Visualzation examples from this Data as a response below..!